With the continuous momentum of Newsboys' current CD release Born Again, a No.1 radio hit and an extensive touring schedule, they continue their whirlwind year with the announcement of their first-ever Christmas project. The CD was produced by Dustin Burnett, Michael Tait, and Juan Otero of The Write Bros, half of the production team of Born Again. Comprising six holiday classics, Christmas! A Newsboys Holiday includes "Winter Wonderland," "Jingle Bell Rock," "All I Want for Christmas is You," "O Holy Night," "The Christmas Song," and "Mary Did You Know." About "Christmas! 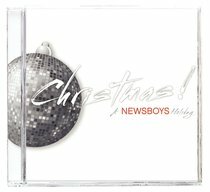 a Newsboys Holiday"
Customer Reviews For "Christmas! a Newsboys Holiday"
What a surprising mix, and not all good. What is so odd about it is that this band who has spent so many years proclaiming "God is not a secret" and being "Not ashamed" of the gospel, is in their first Christmas album there is a real lack of Christmas songs which refer to the Christmas story. Other than "O holy night" which doesn't sore as one would hope, it basically refers to snow and santa. Not that I am not saying there is not a place for it, it just feels like an odd step. The songs are good, but not great, they are fun but not groundbreaking like some of their other material. I hope the next time they do this they can push the envelope a little more and sing more about why we celebrate Christmas.